For several years All Week has partnered with several of the leading manufacturers of top-rated air conditioning units sold in New Jersey. We provide air conditioners repairs, installations and full support for all major brands for both commercial and residential customers and take tremendous pride in the fact that we have the experience to service virtually any brand of air conditioning system ever made. Our company is licensed, certified, fully insured and bonded to complete any Air Conditioning service. A typical process of handling a complete project for residential or commercial clients, goes from inspecting the current system, diagnosing any existing or potential problems, concluding whether only repairs or an ac system replacement is needed and finally providing the client with an estimate. This whole process is FREE of charge. Our highly passionate HVAC technicians are Nate certified and frequently receive trainings for all supported brands new products, from the brands technical reps themselves. When we choose to support a certain a brand we want to ensure that we’re 100% qualified. All Week understands that sometimes older air conditioning units simply need to be replaced. 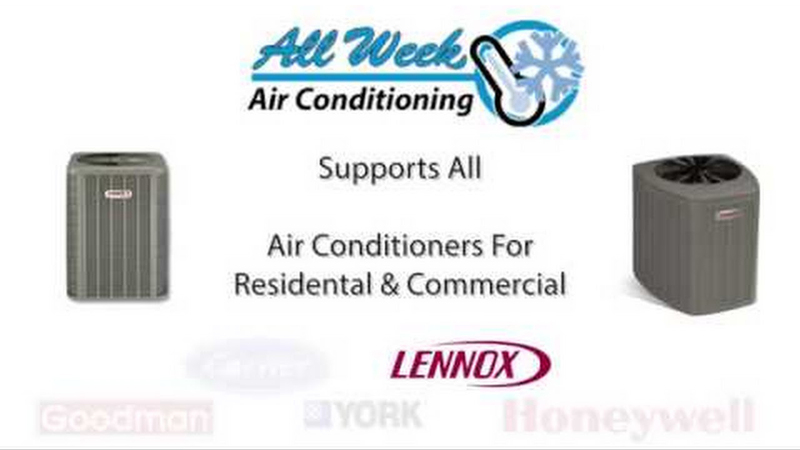 Thanks to our partnership with over 11 different brand name manufacturers, we can offer you the best possible pricing on these amazing air conditioning systems. Each of our air conditioning unit installations are carefully planed and implemented to meet your project’s specific needs and budget. We also take pride in the fact that we can service all of the above brands and many more. Regardless of how new or old your air conditioning system might be – we have an affordable solution to get it back up and running optimally. We also have several routine maintenance programs; specifically tailored to meet the recommendations of all major brand name products. All Week has the experience and know-how to get your job done right – the first time. If you have any questions about our AC Services we provide in New Jersey for any of the brands mentioned above – please feel free contact us today, and consult with a brand expert.